After initial research and discussions with other business owners and our business partners, we began noting some basic questions that surround email segmentation and where the lack of functional understanding lies. This blog will help you, as a business owner, achieve success through email segmentation by answering those same questions you have. Increasing market competition and improving technologies have been at the forefront of the digital revolution we are seeing today. With little signs of slowing down. Business owners have sure been left scratching their heads due to changing algorithms & ad platform updates. Which is where we think we can arm you with enough information to take on the tech and have a trusted ally by your side that will face-on help your business solve real problems. Explaining everything from Facebook Advertising to what to post on Instagram. We have your business covered. Such a dynamic environment filled with competition and technological advancements has urged business owners to expand their communication channels and has presented challenges to reach customers effectively. This blog focuses on one such channel – email marketing. From its humble start in 1970’s, to its meteoric rise in early 2000’s, email marketing has come a long way. Studies show 72% of U.S. business owners consider email marketing to be the best marketing tool to increase loyal customers for their businesses. It is no surprise that email marketing has an important place in every business owner’s marketing arsenal. Data & Marketing Association reports more than 80% of digital marketers actively employ email segmentation as a marketing tactic. A topic we will cover intensively for business owners. Fun Fact: Only 37% of small business owners today consistently use email segmentation as a top marketing tactic for their customers. Through this blog, we want to equip you with enough knowledge on email segmentation so you fully understand all the benefits it offers. Read how to use email segmentation and how to utilize simple business data to improve your email marketing efforts. You will also learn how to communicate with customers through your email marketing funnel – from customers who are not even aware of your products to the more involved customers interested in new product launches. Emails sent out to customers using some form of email segmentation generate a 39% higher open rate as compared to emails that are sent out without any type of email segmentation. Moreover, segmented emails have a 24% higher chance of leading to a purchase than regular email blasts. Let’s talk about how email segmentation can effectively help business owners communicate with their customers both to grow sales and make brand connections. So, what exactly is email segmentation? Imagine you own a small sweets store. As a business owner, you know how some of your customers like candies while others like only cakes. There are some who buy from you more often while there are some who buy only during a sale. In terms of marketing, each of these different types of customers is called a segment. Each segment is unique with their own likes, dislikes, behaviors, and interests. Now, as a business owner, rather than sending an e-blast about your business, an effective tactic would be to design different email marketing campaigns for each of these different segments. This in true marketing sense is better called – email segmentation. Why is email segmentation useful? When it comes to communicating with customers, a good rule of thumb to always remember – “Your customers aren’t all the same.” Whether you are a service provider or a small shop in a local neighborhood. All your customers are unique and need different levels of motivations to purchase your product. Some need a social push, while others need a discount. Each having a different persuasion trigger. Other than the different personalities of your customers, it is important to note that each user is at a different stage in the buying process. Some are your potential customers while some are already loyal customers or some may be past customers you’re trying to reel back in. Sure, going through massive customer data & segmenting contacts into groups might mean a lot of work. But once completed you can clearly see the different personalities of your customers and how they can be communicated to through different email marketing campaigns. Doing so will help your marketing message stand out in a tone they resonate best with your target audience. How do you segment customers? Answer – 8 top ways business owners can perform email segmentation of their customers. To give a sigh of relief to our readers, we have scrubbed different lists of email segmentation tactics and compiled a quick-fire checklist of top 10 segments based on customer type that you can take advantage of. Sure, there is no standard way to success (each business has its own set of customers with unique data) but these are just some examples of email segmentation best practices. Go ahead try some for your business. And give us a thumbs up! Whether you are a restaurant franchise owner or run a car wash, chances are your customers are divided into different classes based on age & gender. Segmenting them using this data can help you choose different marketing tactics to use on each segment of customers. Just like how a newly opened café in Detroit, segmented all its customer data from opening day to make a Mother’s Day email campaign targeted towards women aged 35+. They spoke about how the café was doing a promotional campaign for mother’s and that they were invited to enjoy the special day. Any guesses how it worked? Mothers came in groups of friends and the campaign fared beyond expectations with higher than launch day sales. Grouping your customers by demographics may seem like the most basic email segmentation tactic but it is often ignored and shouldn’t be. Tastes, preferences, purchases, and time of visit are just some of the ways your customers are unique. Segmenting them by their user behavior can give you deep insights about how to market to them. For example, a bakery can dig deeper into its business intelligence and discover there are some customers who regularly purchase newly released bread or cake items. Such customers can be invited to try out new items along with their friends. Targeting those highly likely to try new items can help increase ROI and set a stage for further email segmentation. Another simple yet effective way to segment customers is by looking at their engagements with previous emails. Have they opened or clicked on your past emails? Responded or shared? Looking at this data, we can define their level of interest and target specific communication to them. Useful tip: Most newer email automation tools have a scoring system within their platform that allows you to rank customers based on their past email activity. Different drip campaigns can be set up for users based on their scores. We’ll dive more into this later. Segmenting customers by their geography is a great way to build some quick rapport. Such a segment can help you communicate with your customers by playing the “we are local too” card. For example, when Uber launched its feature targeting conference attendees, they targeted customers in cities which had upcoming conferences with promotions. Thus, increasing ride bookings to and from the conference. Customers can further be segmented into four main types based on their purchase stages. First, you have potential customers who may be the perfect targets for your business. Think customers nearby your business location, neighborhoods with specific demographic features, etc. Then there are all new customers who have just formed a relationship with your business. This is a group that needs more marketing touches reassuring them of their choice. This is a great opportunity for business owners to form the first relationship and mold their customer journey into a memorable one. Next up are the discount seekers. This is a group of customers that have made a purchase only with coupons or when you have offered a discount. Even though there is a cost to acquire such customers, when targeted correctly, they can be the perfect audience to upsell your products to along with the discounted bait product. Last but not the least are your regulars. Your herd of loyal customers that need little or no push at all to bring in repeat business for you, time and time again. Business owners crave for this group of customers! And when they do get them, it is very important to segment them for the longest retention possible. Send different email campaigns focused on spreading word of mouth marketing, leaving positive online reviews, and making sure they remain loyal to your business. Either in the form of website signups or as business intelligence collected when you talk you them, document your customer’s personal interests like – their favorite flavors, styles, hobbies, etc. You will be surprised how useful it can be in promoting your business. For example, a chiropractor used customer data from form fills to target customers who might require chiropractic service after a recent marathon in town. People who selected jogging/ fitness as a hobby were sure to participate in the marathon and proved to be right audience, at the right time. This type of segmentation is more relevant for B2B companies looking to dive deeper into email marketing tactics. People in a business to business marketing role understand how they will come across customers with different team size, job titles, etc. on a daily basis and need to adapt their communications accordingly. In such a situation, it is extremely useful to segment your customers based on the size of their organization, their specific job titles, department structure, etc. This way when the time comes, you know which users to target for the most effective results. Marketers often segment their business customers based on job titles so that they know exactly what the purchase triggers are. Salesforce takes it a step further by segmenting customers based on the number of decision-makers in the respective company they are trying to target. You can get as detailed as you like when it comes to email personalization and segmentation. Every business is different, so do what’s best for your business. 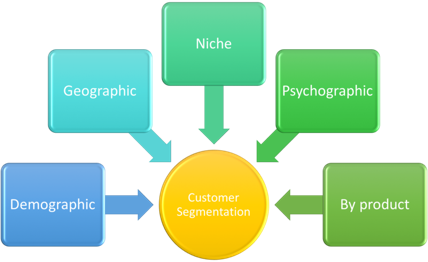 In this type of segmentation, you can create customer segments based on customers’ past purchases. The item they usually order, was is it in store or online, etc. Buckets like these can give you a great opportunity to upsell your products. For example, customers who always buy sandwiches from you can be emailed about a special discount on a drink with sandwich purchases. Or, customers who have only ever purchased from you through your website can be given a reason to come in and experience what your store has to offer. Smart segmenting tactics like these can help boost your email marketing campaigns and drive a better ROI. How do I collect customer information for segmenting emails? Now that we have looked at the different email segmentation tactics and best practices, the next question left to be answered is how does a business owner go about collecting such business information? The answer simply lies in finding every right opportunity. There are more than many ways to collect customer data. Whether it is through a sign-up form on the website or interacting with the customer during his visit to your business. Chances are, your customer is already giving out useful data to help you serve him better. Additionally, you can look into a customer’s past purchases and order history to generate business insights. Marketers in the past have successfully created customer surveys too with a giveaway to lure customers into giving out some information about themselves. Another option that we do not suggest is purchased lists. This option may seem easiest, but it is definitely not the most rewarding. These lists are not segmented properly and may not even contain your target audience. Always collect new contacts and customer information yourself. Never buy your list. What is the best way to send emails to a segmented audience? The answer to this question lies in email automation. There are dozens of tools available that allow you to segment your customer email lists and make drip email campaigns that automatically send out emails at the desired time or after the desired action is taken. Some are free and others come with a fee. There are many more benefits of paid tools that let you do so much more including scoring, subject line ideas, and landing page creation. But to keep it simple, we are only going to be covering the free email automation plans that you can use to segment your customer emails and schedule automated trigger emails. One such free plan is MailChimp’s forever free email plan that lets you send up to 12,000 emails to 2,000 customers for free every month. Bonus: Why should you use these ESP (Email Service Provider) tools? Another benefit of using an email marketing platform is that it lets you track the performance of your sent emails. Number of opens, number of website clicks, bounced emails, etc. are just some of the metrics that your regular email inbox (think Gmail and Hotmail) will not be able to tell you. This serves as a big advantage for businesses that want to keep an eye out on how their emails are performing and want to test 2-3 different types of templates. But even if you want to keep it simple, while you get the hang of email segmentation & marketing, this is a great addition to your marketing arsenal. What are the benefits of doing email segmentation of my customers? Beyond the discussed benefits of list segmentation and email campaigns, there are additional benefits in other areas of your digital marketing portfolio. Combined with a business intelligence outlook, you can use email segmentation to upsell products. A great example of a business taking advantage of this is meal delivery startup called Grubhub. They first do a great job of collecting customer emails contacts and data like their birthday, address, etc. Which then leads to email drip campaigns based on their birthdays & job profile. After the initial touches, they indulge in a direct response campaign where they send out a coupon and information about nearby cafés & restaurants. It doesn’t stop there. They also segment their customers by purchase frequency. They then take this data and upload it to their accounts on big social platforms like Twitter and Facebook. In turn, the social powerhouses use their algorithm to find similar users based on the same behaviors and patterns. Grubhub just found more potential customers to target on social media through email segmentation. This is one of the best uses of email segmentation we have seen and highlights the power of this raw form of marketing intelligence. Through this blog and our previous series filled with helpful marketing tips for business owners, we not only want to educate you about the different marketing tactics but also give you the tools and means you need to grow your business. This information might be overwhelming at first. In which case, we would be happy to discuss email segmentation over a cup of coffee – you’re paying, of course  So really it’s just a quick phone call, but it will be the best call you make all day!